In wandering through the crowds gathered within the multiplicity of fora dedicated to mechanical horology, one encounters a diverse buzz of interests and knowledge: here a group discussing steel sports watches, there one debating gold dress watches, over there a man shouting out “Which watch to buy…,” on the atrium’s pulpit someone giving a dissertation on the superiority of Brand X to Brand Y, while in a small gallery to the side a handful muse over the conjoined symbolism of perpetual calendar chronographs. It is only down a little used corridor, thick with dust and dimly lit, to a place on the edge of the general watch enthusiast consciousness, where the halls echo hollowly, whispering of the controversial fascination of tourbillons and the purist art of striking watches — all the esoterica of high horology. There are a few lost souls that wander this labyrinth like ghosts, navigating past the Scylla and cCharybdis, the Sphinx and Chimera, to the inner sanctum wherein the Mysteries are delved. The entry way to haute horlogerie is a shadowed and indeterminate threshold, but it is my thought that its realm begins with the tourbillon regulator, featured in either a simple time-only movement or chronograph, and rare astronomic complications like the equation of time. A step above these are the striking complications — the heart and soul of haute horlogerie, as both the most ancient family of complications and the single most difficult to execute by a master watchmaker. Yet while repeaters and clockwatches are sublime in themselves, it is the grandes complications which use them as a base for further complication that take the seat of honor in haute horlogerie, and are that upon which hinges the status of most manufactures amongst their peers. They are also that which most strongly captures the imagination of those otherwise unmoved by the higher forms of the art. As there is no “official” definition of a grande complication, despite certain marketing to the contrary, I have attempted here to use the term in a seemingly sensible fashion: any striking movement with at least one other major complication, and with or without a tourbillon regulator (though some will find this too broad, and others too narrow). Throughout recorded history it has never been enough to be wealthy, as to be seen to be wealthy: to be counted rich hung upon the open display of riches — it was and remains a competitive code of conspicuous consumption, and it is this which financed a complications race between the world’s best cabintotiers and manufactures. This cold war traces its beginning to the declining French monarchy and the age of the great horologers of France, England, and Geneva — when most watchmakers were focused on chronometer development and making improvements to basic timekeeping. While the first known minute repeater with perpetual calendar was made by Jean-Antoine Lepine for King Louis XV in 1770, it was Abraham-Louis Breguet who put the most effort into integrating multiple complications into a single watch. 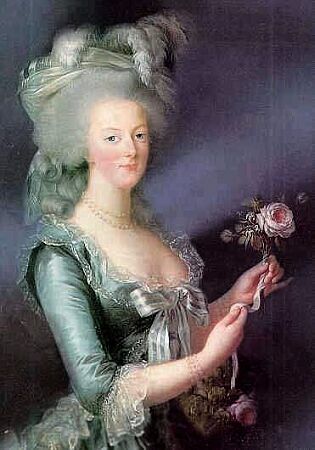 The archetype of the class was begun by him in 1783, a “perptuelle Grandes Complications” for Queen Marie Antoinette. 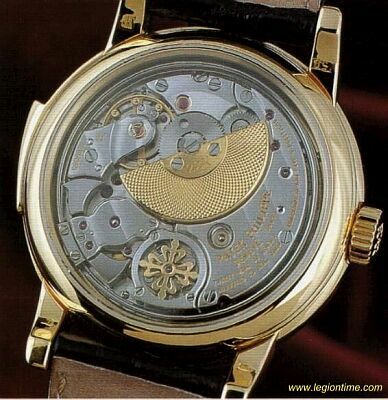 Made of solid gold – plates, bridges, wheels, and case – with a transparent natural rock crystal dial, it featured automatic winding, perpetual calendar with equation of time, minute repeater, independent seconds (a predecessor of the chronograph), thermometer, and power-reserve display. The Queen was executed in the French Revolution decades before the watch was finally completed. With the basic concept and patterns for grandes complications laid out by these seminal works, the door was opened for a small but long lineage of such watches from the mid-19th century onwards. The difficulty of integrating the disparate complications make them the most challenging to design, and the most painstaking to manufacture and assemble by a master watchmaker. While one would intuitively think them the decathletes of complications, good at each but not the best of any, most reports indicate that the tone and volume of their striking complications is unmatched, and the workmanship of their calendar and timing complications is taken to a level unseen elsewhere — making them in some ways the paragons of the craft. As with the breakthrough examples by Lepine and Breguet, grandes complications were the sole domain of royalty: first in the old sense, and later in the new royalty of banking and industry — the new super-rich. A few ateliers and watchmaking houses have been founded upon the manufacture of grandes complications – Audemars Piguet for example – but any house which presumed to greatness found it necessary to produce at least a few such watches, and for a few dedicated to the art of haute horlogerie, they would be the standard bearers of brand identity and prestige. Of all of the surviving great houses, it is Patek Philippe which is best known within haute horlogerie for its work in supercomplicated watches, particularly in astronomic complications. 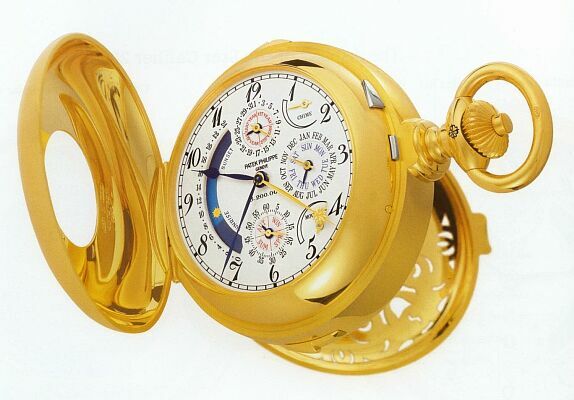 In the early 1900s Patek Philippe made a number of highly complicated pocket watches for one of its wealthy patrons, automotive pioneer James Ward Packard, several of which are grandes complications of special note, with ten to sixteen complications in each. Rather than the simpler minute repeaters used in most grandes complications, two of these Packard’s are complicated clockwatches. The first made in 1916 for example, had a 3-gong chiming Grande et Petite Sonnerie with minute repeater, perpetual calendar with moonphase and retrograde date indicator, power reserve indications for both the strike and timekeeping trains, and a split-seconds chronograph. In an attempt to upstage the entire Packard collection in a single stroke, industrialist Henry Graves Jr. commissioned Patek Philippe to produce the most complicated watch ever conceived to date. Starting in 1928, Patek Philippe’s master watchmakers researched and worked on the design for five years, producing Graves’ namesake Supercomplication, a large (1# 3oz) coach watch with 24 complications. 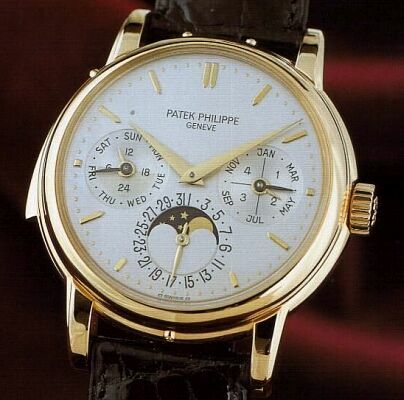 It was delivered to Graves in 1933, the same year that Patek Philippe itself was purchased by the Stern brothers. A “coach watch,” by the way, is essentially a carriage clock (usually with strike and/or repeat functions) compressed into the shape of a pocket watch, but much too large for pocket carry at about twice the size. The Graves Supercomplication remained the greatest of Patek Philippe’s work in grandes complications until the celebration of its 150th Anniversary in 1989, when it took a large step forward in both coach watch and wristwatch complications. 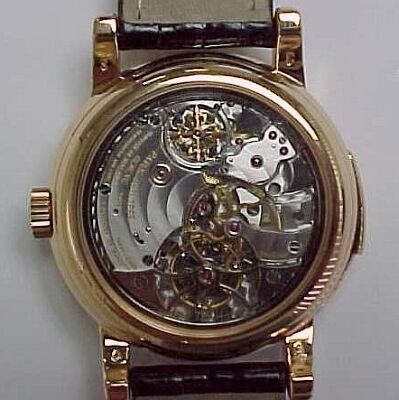 Taking five years to research and four to manufacture, the Caliber ’89 coach watch with 33 complications – nearly half again as many as the Graves – became the most complicated watch ever made, and limited to only four examples for sale: one each in gold, rose gold, white gold, and platinum, with a gold prototype reserved for Patek Philippe’s museum. Weighing in at 2.4 pounds it stretches even the proper dimensions of a coach watch. Produced concurrently with the majestic Caliber ’89, was a revived classical form of the grandes complications wristwatch, a minute repeater with perpetual calendar. The innovation of the ref. 3974 (shown above) lies in its movement’s micro-rotor automatic winding — the first and only such applied to a repeater calibre design. The new movement, calibre R 27 Q became the most coveted repeater movement in modern haute horlogerie, in both its simpler form R 27 PS (without calendar) and in its grandes complications forms. The next step in development in Patek Philippe’s grandes complications wristwatches came in the form of the redesigned calibre R 27 in 1995, as a hand-wound movement with tourbillon regulator. As RTO 27 QR, with perpetual calendar and retrograde date, the new calibre became the most complex wristwatch movement in production at Patek Philippe, and the crown jewel of their “Grand Complications” collection. The quality of the movement’s redesign, which displaces the automatic winding with a tourbillon regulator, shows no clumsy modularity and is one of the great works of modern haute horlogerie. Of course the house did not rest on its laurels, and even as the ref. 5016 won the hearts of collectors, it had likely already begun development on the next evolution of the movement, reaching towards a new pinnacle in their grandes complications wristwatch designs, as well as continued dominance in the rarefied tradition of double-faced pocket and coach watches. It was in the last year of the second millennium CE that Patek Philippe announced a new limited series of complicated hunter pocket watches. While a spiritual descendent of pocket watches from the Packard collection — in particular an example from 1927, it was built closer to the scale of the Graves Supercomplication, weighing in at 1lb 2oz, and bearing 21 complications. This “Star Caliber 2000″ (shown at top) is a dedicated work in their signature astronomic complications, with progress also made with its five-gong striking complications. The large celestial chart with lunar orbit and phase which dominates it’s second face is complemented by the perpetual calendar and equation of time on its first. To weed out the ordinary millionaires and to maintain the desired level exclusivity, the limited edition of 20 examples is being produced in five sets of four pieces — as there are only four owners of Calibre ’89, there will be only five owners of Caliber 2000 in the world. The first four sets will be comprised of one each in gold, rose gold, white gold, and platinum, all with matching engraving within each set, but each set having different engraving from the others. In the fifth set all four pieces will be in platinum, but each watch which feature unique engraving. As with Caliber ’89, the Star Caliber 2000’s prototype is reserved for the Patek Philippe Museum. In 2001, following a year after the introduction of the Star Calibre 2000, Patek Philippe finally unveiled the “Sky Moon Tourbillon” (shown at bottom), ref. 5002. 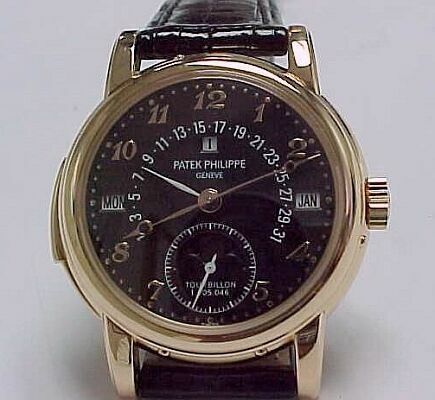 While its calendar-side aesthetically takes a page from their rival Audemers Piguet, it is otherwise all Patek Philippe — decorated on both dial and case with the “Calatrava Cross.” The double-faced wristwatch takes their minute repeater tourbillon calibre, RTO 27, and adds a perpetual calendar on one side, and a star-chart with lunar orbit and phase on the other, using a module adapted from their Star Caliber 2000. With an annual production limited to two pieces per year, total production will be limited by the number of years of production — but I will be surprised if the total exceeds the number of Star Caliber 2000s being produced. It is the pinnacle of their work in astronomic wristwatches, and its star chart makes it the only one of its type, though its size stretches the bounds of wearability. But considering the opulence of the display case that it is provided with, it will probably be treated more as an object d’art than as an actual wristwatch. Essentially a Calibre 2000 for the wrist, one can only wonder when we will see similar treatment of the Graves Supercomplication and Calibre ’89. In the otherwise secret world of haute horlogerie, it is the grandes complications which lead the competition for status between the great houses, and which embody pageantry, spectacle, and unabashed excess. Already the private domain of the wealthiest collectors, it is only a handful of the richest which have access to the best grandes complications, and so it has been from the time of Louis XV to the age of the princes of the industrial revolution, to today’s latest wave of nouveau riche. For most of us they are not the apex of what is attainable, but instead are symbolic of that of what is achievable, and a little bit of the soul of these pieces is shared in the simpler pieces whose sales support the production of these greater works of the art. For the house of Patek Philippe, their special place in this world was hard won, but their vigilance and struggle cannot slacken, for fresh challenges and challengers old and new wait upon the horizon, as the stars fade before a new dawn. Star Caliber 2000 and ref. 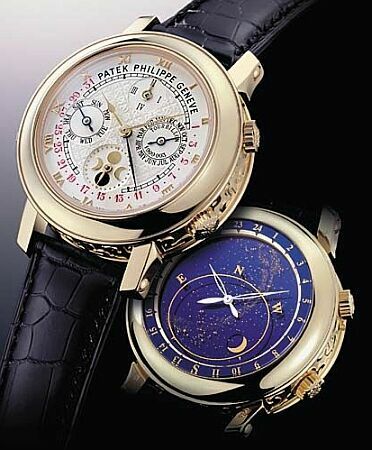 5002 courtesy of Patek Philippe, S.A.